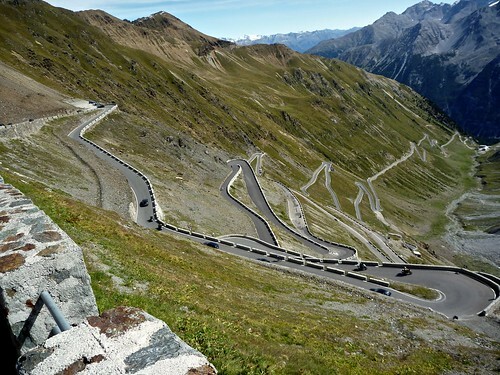 Passo delle Stelvio is one of the very highest and – perhaps – the most spectacular road cycling climb in Europe. There are three ways up to this incredible pass. The north-east side is the most famous, I cycled it last July, details here. Truly amazing. 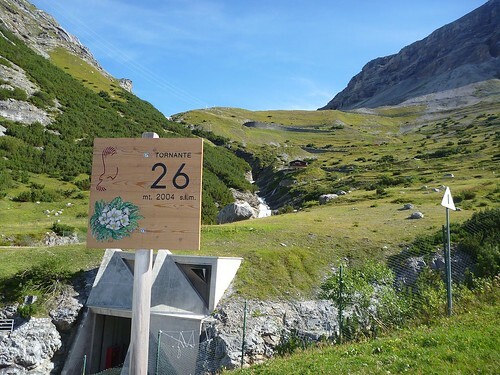 Today, I explored the other two ways (see map): the well known Bormio route, and a lessor known route from Switzerland via the Passo Umbrail – the highest Swiss pass I have ever cycled. 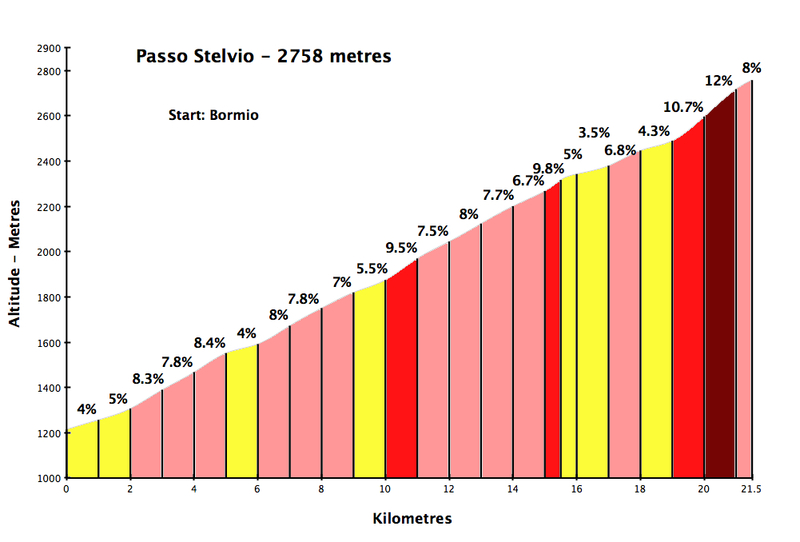 Starting in Bormio it’s a little more than 22 kms to Stelvio. 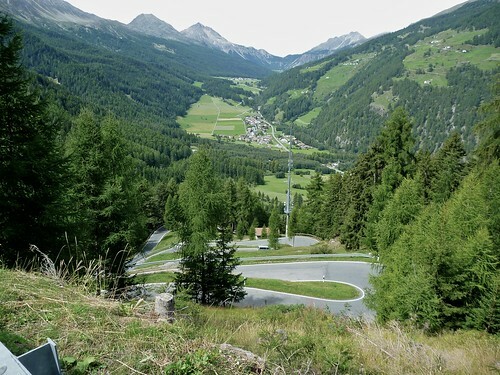 There are 40 signed hairpins, most of them in two sections, half way up, and the last few kilometres. About 6 kms in, there is a long straightish stretch along the edge of a steep mountain. 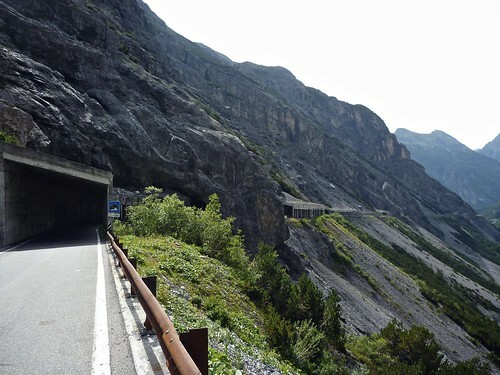 Likely due to avalanches, there are a series of tunnels. None too long, but sometimes dark and occasionally very narrow. I strongly suggest wearing something light coloured and reflective to ensure the cars (and numerous motorcycles) can see you. After the tunnels the real fun begins. Hairpin after hairpin beside a beautiful waterfall as the road climbs and climbs. 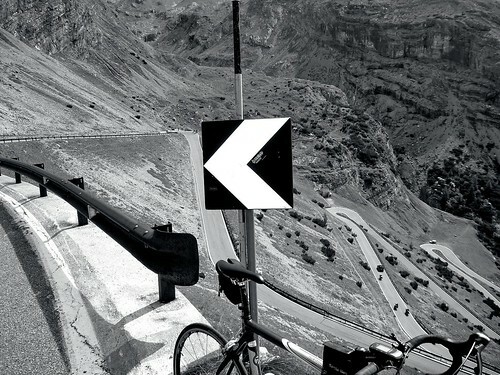 It’s one of those rare and truly special sections of road that cyclists dream of. 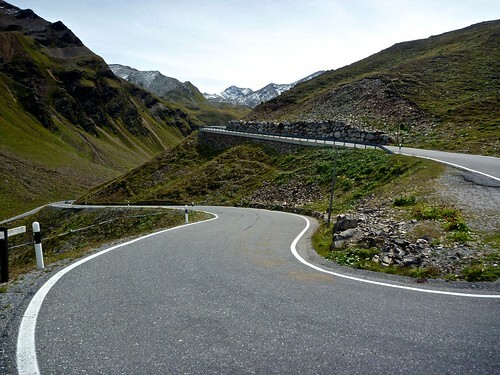 Next is a long straightish stretch that is less steep through an alpine valley heading towards Passo Umbrail. 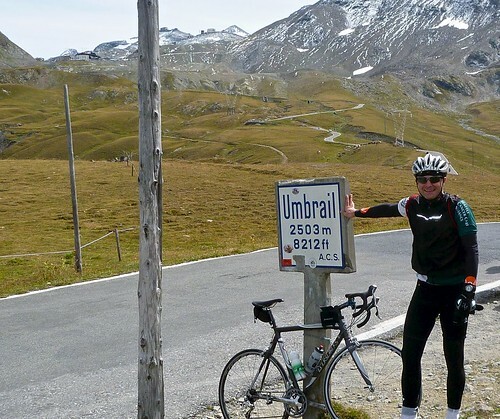 Umbrail is in Switzerland on the Italian border. 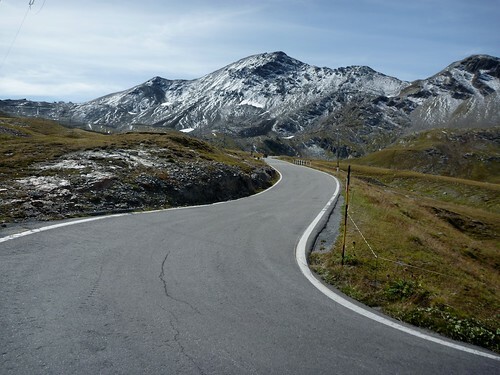 It sits in the shoulder of the Stelvio route about 3 kms from the top – similar to how Col du Glandon sits on the shoulder of Col de la Croix de Fer. 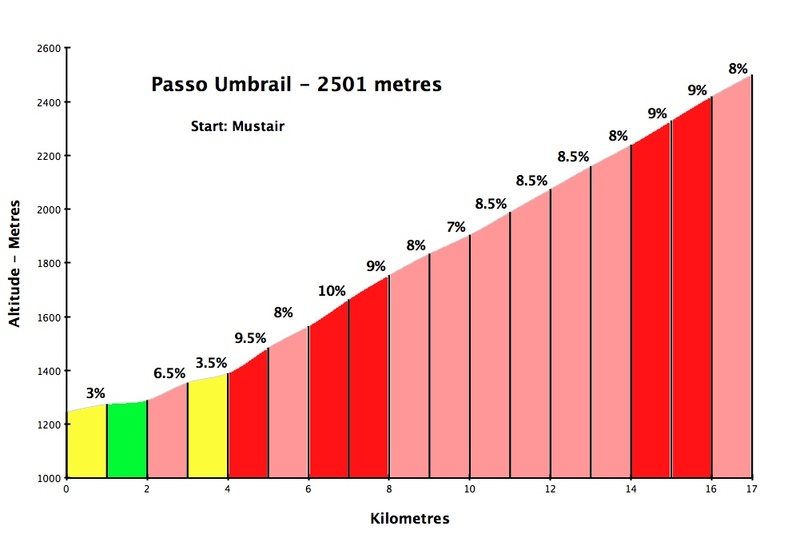 As I passed Umbrail, the steepest stretch to Stelvio begins. I could see the numerous buildings above as I approached – it must be the most built up high pass I have ever seen. Hotels, souvenir stores, restaurants, ski lifts, Tibetan retreat (! ), etc. Crowded. I had a bite to eat, peaked over the other famous side (see photo below), bought a Stelvio head scarf, rehydrated …. and headed down to Umbrail. The legs felt OK, so I descended Umbrail into Switzerland. It’s a superb, hair pinned descent – especially the top and nearing the bottom. There are no towns, just a few cows and great views. Just one flaw! Although most of the road is surfaced like a billiard table – there are two kms in the middle that are gravel. WTF! When I reached the gravel stretch I had no clue how long it lasted – but I could see that it was at least for a while. I flagged down an ascending car and asked. I was ready to give up when 2 road bikers went flying down past us, totally un-perturbed by the gravel. Fair enough, I followed. It’s a shame, but not a show stopper. I went slowly and am glad I took the chance – because the bottom section is worth the effort (and PERFECTLY surfaced). I skipped the first 4 easy kilometres on the main road (see profile) – but one can start at another Italian border near Mustair. 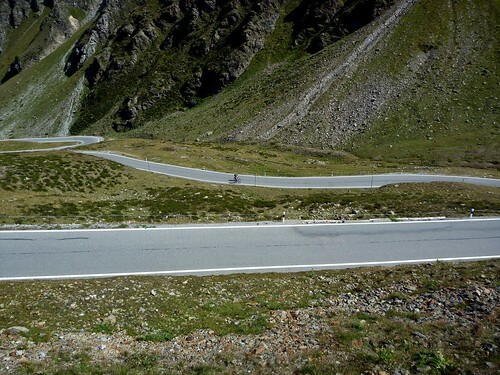 This has to be the quietest of the three ways up to Stelvio. A terrific climb, but if you hate gravel, bring a hybrid. Another great day. 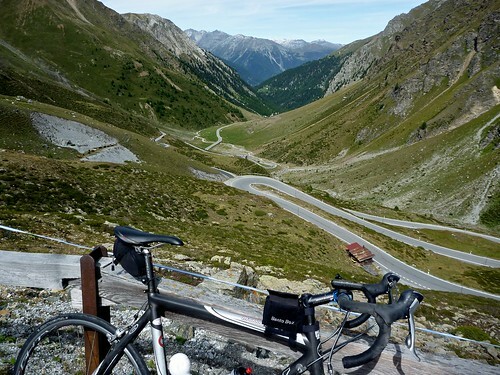 Bormio is a true cycling Mecca. 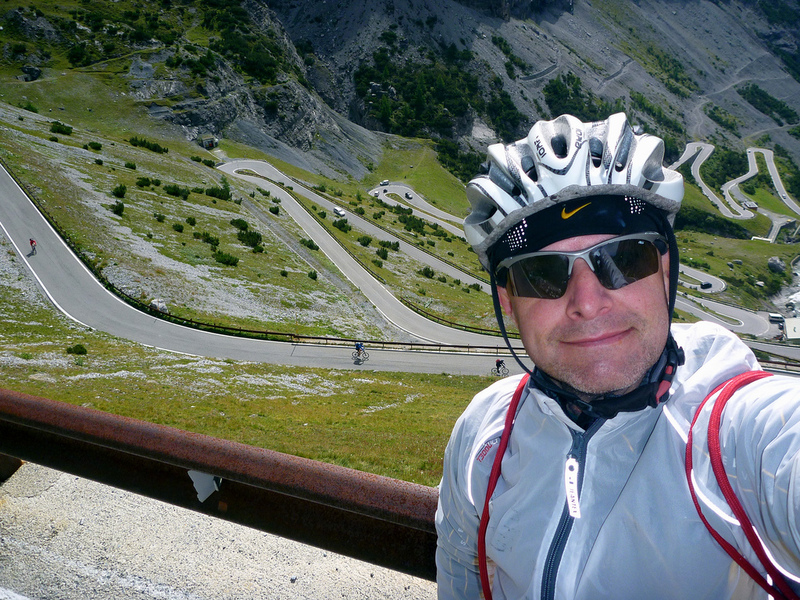 The less famous of the two Italian routes up Stelvio is still pretty damn great. And the route includes a lesser known 3rd Swiss way up that is virtually deserted. A true classic. Some Chilly looks like a happy camper!!! Glad you`re having so much fun. You are having the cycling trip of a lifetime! Fantastic and congratulations mon ami! 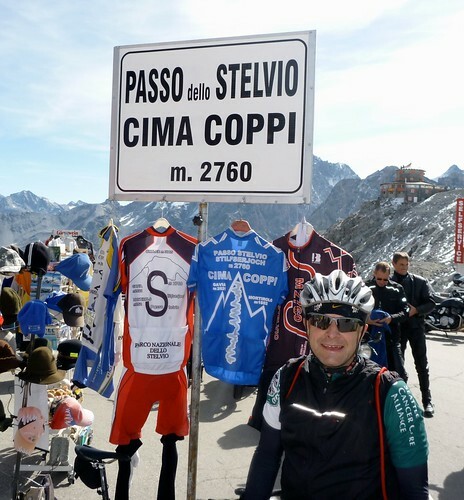 I rode the Bormio side in 2012. I thought it beautiful, was very lucky with the weather. It was made a bit poignant by the old WW1 buildings and especially by the Oratorio of San Ranieri. 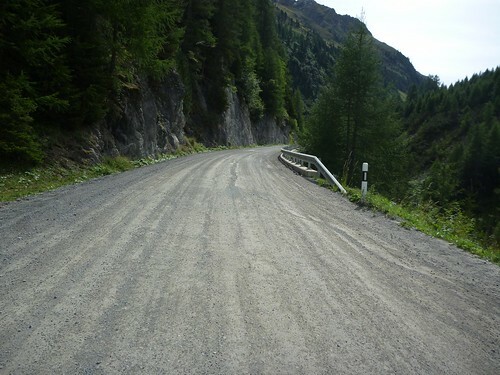 I descended from Passo Umbrail last week and they have been upgrading the gravel section with Tarmac, there is only about 200m left to do which I suspect will be complete by now. Good news! The road is full surfaced from July this year.